Scheduling Chris Mullin’s Madison Square Garden homecoming for 11 a.m. on a Sunday morning wasn’t exactly calculated to produce goosebumps, and when St. Francis took an early nine-point lead, St. John’s fans in the crowd of 7,196 might have gotten the wrong kind of shivers. But veteran Durand Johnson and freshman Yankuba Sima combined to produce enough offense to give the Red Storm a 63-56 victory Sunday. 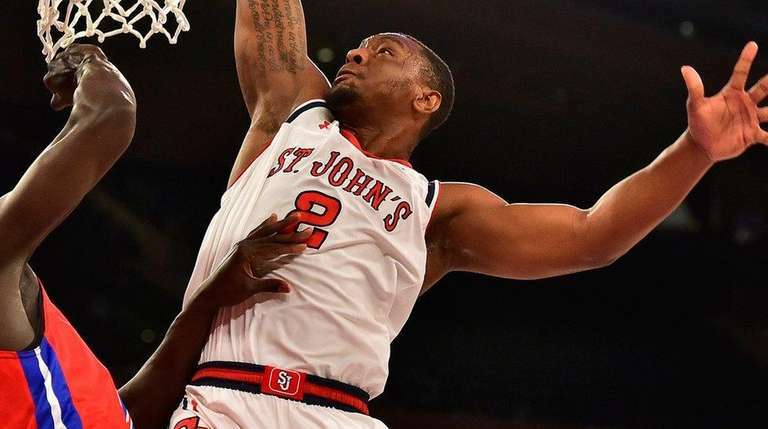 Johnson had 10 of his 19 points in a 19-0 first-half run that put St. John’s in control, and when the Terriers (3-5) threatened late, Johnson buried a baseline jumper with 30 seconds left for a four-point cushion that allowed the Storm (5-3) to hang on. The Red Storm was coming off a devastating loss at Fordham and could ill afford to drop another to a smaller local school. Johnson has been up and down after sitting out more than a year because of knee surgery and a suspension at Pittsburgh, but he came up big with 19 points on 7-for-12 shooting. Sima was held scoreless at Fordham but responded with 17 points, 10 rebounds and five blocked shots, and Christian Jones added 13 points and nine rebounds. St. Francis got 10 points each from Yunus Hopkinson and Antonio Jenifer but shot only 33.9 percent and was outrebounded, 45-33.